Have you guys checked out the newest updates on the Confessions app this month? This month I partnered up with Vicki casciola (originally featured last december) to give us all - myself included - a tutorial on using Hair talk’s tape-in extensions. 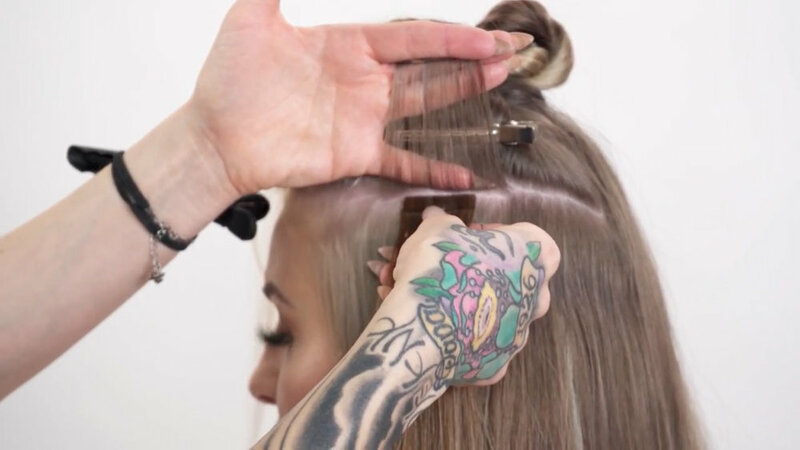 Vicki is the global artistic director of Hair talk so she knows whats up when it comes to extensions which she shows us in her insanely helpful demo on the app. Be sure to check out Vicki’s exclusive interview and two upstyle tutorials, and keep up with her on instagram if you aren’t already! IF YOU DON'T ALREADY HAVE THE APP BE SURE TO DOWNLOAD IT (itunes HERE + google play HERE!) FOR JUST 9.99/MONTH YOU'LL GET FULL ACCESS TO THE entire library OF TUTORIALS BY MYSELF AND ALL THE OTHER ARTISTS WHO'VE BEEN FEATURED ON THE APP! THAT'S OVER 100 TUTORIALS ON CUTTING, COLORING, UPSTYLES, BRAIDS + BUSINESS RIGHT AT YOUR FINGERTIPS!